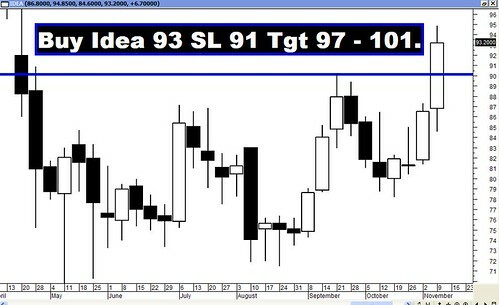 Archives : DEEPAWALI SPECIAL - EXPECT NEW HIGHS THIS YEAR - 09/11/2012. EXPECT NEW HIGHS THIS YEAR - 09/11/2012. Both Sensex and Nifty were in correction mode for more than 2 years now. The all time high registered in 2008, were challenged in 2010, but the indices failed to cross those levels. 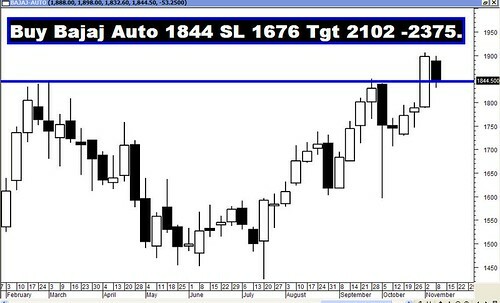 We expect the market to test the all time highs (Sensex 21308 and Nifty 6357) this year and move higher. The journey for the bulls won’t be a straight and easy one because there will be many obstacles on the way. One of the major challenges will be the revival of Growth which has been battered down to 5.5% thanks to some poor policy decisions taken by the RBI. The rate tightening cycle seems to have run its course and now we hope better sense prevails and the growth story revives. One of the major reasons for optimism is the return of Mr. P. Chidabaram as the FM. The market has celebrated his bold decisions like increasing the FDI limits in Insurance and Retail, increase in Fuel prices and decrease in subsidies. The way this government refused to budge, despite strong political and public outcry, gives FIIs more confidence in the reform process than ever before. 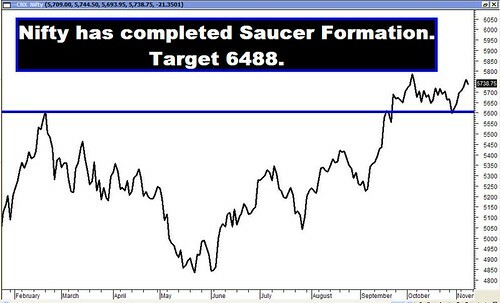 Both Sensex and Nifty have completed Bullish Saucer formation starting from February 2012 to October 2012. The depth of the saucer for the Sensex is 2775 and for the Nifty is 859. The target thus works out to be 21298 for the Sensex and 6488 for the Nifty. On a cautionary note, the bulls need to maintain and stay above Sensex 17250 and Nifty 5215 for uptrend to continue. In case the above levels are breached, then the medium trend will be reversed and then the Sensex will move lower to the support zone around 15700 to 15800 and Nifty 4700-4800. After making a high of 21108 for the Sensex and 6338 for the Nifty in November 2010, the market has been in correction mode. It is only now that the Sensex and Nifty are coming out of correction mode since both the indices are above the 61.8% Retracement level (Sensex - 18827 and Nifty - 5648) of the fall from 21108 to 15135 for the Sensex and Nifty 6338 to 4531. Thus if the Sensex continues to stay above 18827 and Nifty above 5648, then they are likely to test the previous high of Sensex 21108 and Nifty 6338. 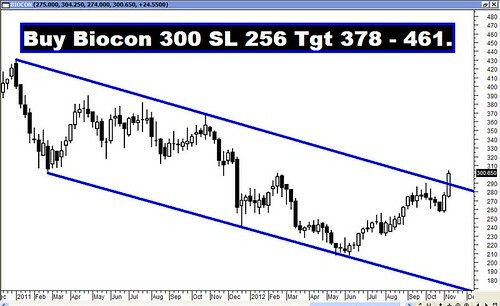 For the year ahead, Sensex will face Resistance at 21108-23013-25317 and Support will be at 17250-15135-13219. For the Year ahead, Nifty will face Resistance at 6357-7018-7695 and Support will be at 5215-4531-3918. After remaining in a small range of 100 Nifty points for more than three weeks, it was widely felt that the upmove will be fast and swift, but there seems no easy way out. The range seems to have widened and now it seems that the Nifty will move in a range of 5600 to 5800 for the time being. But Deepawali is around the corner and the Bulls have their hopes pinned on Deepawali for achieving higher levels. Sensex opened the week at 18749, made a high of 18973, low of 18656 and closed the week at 18683. Thus it registered a weekly loss of 72 points. At the same time the Nifty opened the week at 5693, made a high of 5777, low of 5677 and closed the week at 5686. Thus the Nifty went down by 11 points on a weekly basis. Both the indices opened with a gap down and formed a black body candle on Friday. This candle cannot be classified as a bearish reversal candle. On the weekly charts the Sensex has formed a small body candle with a long upper shadow which falls short of being called a Shooting Star as it has a small lower shadow. Shooting Star which is a bearish reversal pattern occurs at the top of the uptrend which is not the case here as we are consolidating sideways. The Nifty has formed a Doji almost like a Gravestone Doji but with a small lower shadow. Once again the bearish implications are obvious because of the long upper shadow. But this pattern has not occurred at the top of the uptrend, hence the effectiveness of the pattern stands reduced. Currently both Sensex and Nifty are undergoing a correction of the immediate rise of Sensex from 17250 to 19137 and 5215 to 5815 for the Nifty. The Retracement levels for the Sensex are at 18416-18193-17971 and 5586-5515-5444 for the Nifty. The Sensex has bounced from a low of 18393 and Nifty from 5583. Thus the 38.2% Retracement level for the indices has provided support to the market. A breach below the low of the week, will resume the correction. An upside Bullish Gap was created last week between Sensex 18687-18589 and Nifty 5682-5649 which is being currently tested as a support. Besides this, there exists another Bullish Rising Gap between Sensex 18062-18284 and Nifty 5447-5526, which has acted as a strong support for the market before as the Sensex had bounced back from a low 18291 and Nifty 5534. This gap holds more significance because the 50% Retracement of the immediate rise from 17250 to 19137 for the Sensex and 5215 to 5815 for the Nifty (which is at 18193 and 5515) is also within the Gap mentioned above. The indices once again flirted with the short term average of 20dma (Sensex – 18692 and Nifty – 5684), and just about managed to remain above that. Infact Sensex has just closed below that by a whisker. Also the market continues to be well above its medium term average of 50dma (Sensex – 18437 and Nifty – 5593) and the long term average of 200dma (Sensex – 17504 and Nifty – 5311). Thus the trend in the short term has managed to remain upwards, while the medium term and the long term timeframe continue to be bullish. MACD continues with its Sell signal even though positive. ROC has just moved below the centerline and signaled a Sell. RSI has just managed to stay above the equilibrium line at 51 whereas the Stochastic Oscillator is under Sell mode as %K (71) has gone below %D. Money Flow has remained above the centerline at 63. ADX has dropped to around 29 indicating that the uptrend has lost some strength. The Directional Indicators i.e. +DI and –DI still continue with their buy signal. OBV continues to remain in Buy mode. The Nifty O.I. PCR is at 1.09. The highest Open interest build up for the November series is seen at 6000 Call and 5600 Put. This suggests that the market expects a trading range with strong support coming in at around 5600 and resistance at around 6000 levels. On Friday Nifty 5800 strike has seen very high Call writing and hence one can expect a strong resistance at Nifty 5800 in the short term. Trendline Support for the Sensex is at 18428. Trendline Resistance for the Sensex is at 18950. Trendline Support for the Nifty falls at 5596. Trendline Resistance for the Nifty is at 5771. For the week ahead, Sensex will find Support at 18393-18063-17726 and will find Resistance at 18973-19276-19574. For the week ahead, Nifty will find Support at 5596-5499-5399 and will find Resistance at 5777-5874-5944. The recommendations for last week performed fairly well, except for Bajaj Auto and Petronet LNG which could not achieve their targets. However the star performer of the week was Financial Technology which went up by more than 7%!! !